Star Trek has had several different comic book series over the years, starting all the way back in the sixties at Gold Key Comics. With the first feature film, the franchise moved to Marvel Comics for a brief time, but it was at DC Comics where the series was arguably the most productive. The initial run at DC consisted of 56 issues (plus annuals). As I understand it, the stories told during this run were written largely without the input of creator Gene Roddenberry or his office, resulting in some fantastic (but sometimes wild) tales; this changed around 1989, following the release of Star Trek V, when Roddenberry's group began to exert more control over the material, prompting a relaunched, second run of the comic book series at DC. This time it lasted for 80 issues (plus annuals) and was more in keeping with the cinematic vision that Paramount was putting on screens (or at least the one Roddenberry wanted). It was during this run that writer Peter David penned 15 consecutive issues that included a three-comic-arc called "The Trial of James T. Kirk." 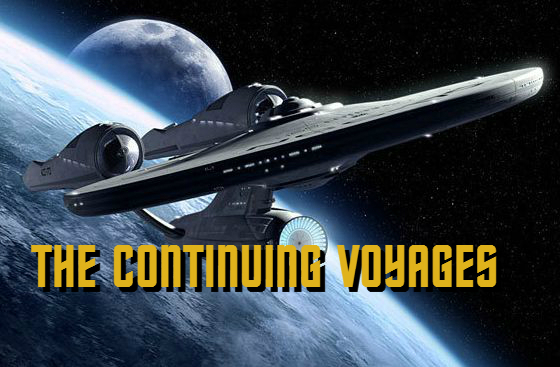 In these issues, Kirk, accompanied by the crew of the U.S.S. Enterprise, has been summoned back to Starfleet Headquarters on the serious charges of 1) breaking the Prime Directive, and 2) MURDER. The trial will determine not only his command, but his entire future. Murder is a pretty serious accusation, and one that we as readers know Kirk would never commit. But The Prime Directive? Yeah, they've got something there. Even casual viewers know that Kirk, as Captain of the Enterprise (during the five-year mission depicted in the original sixties television series Star Trek) broke the directive seemingly every week. The Prime Directive states that Starfleet officers are never to interfere in the culture of any planet, leaving every civilization completely unaltered. This could mean not revealing themselves to a primitive society that has no knowledge of space travel, or staying out of political disputes, as they could alter the course of future events. Anyone from Starfleet must avoid this even at the cost of their own lives. Testifying against James Kirk are several characters that TOS (Star Trek: The Original Series) fans would recognize from episodes of the show. We get Anan 7, the leader of a group of people who had been at war with each other for years, only with computers fighting the battle instead of people ("A Taste of Armageddon"). We get Bela Oxmyx, a gangster from the classic episode "A Piece of the Action." Readers aren't just told that Kirk violated the Prime Directive; they're given examples that they can remember, pulled from the most popular episodes of the show. Before the story has concluded, Kirk has faced off against the Klingon Emperor and a race called the Nasgul, fought an assassination plot, and confronted his own demons. There's a lot in these three issues. So much about this story works. The biggest success is the spirit of the story and its relationship to Trek as it existed circa 1990. Given that this takes place after Star Trek V, the characters are written exactly as we knew them at that point in the movies. Kirk is still angry about what has happened to his son David, and he's prejudiced against all Klingons because of it. Spock is learning to embrace his humanity and the value of friendship, exchanging deep personal feelings with Sarek (yeah, Sarek is totally in this story) about the importance of humans in the lives of Vulcans. The Klingons are written as they should be, not as the allies that they would soon become in Star Trek VI: The Undiscovered Country (and already were in the timeline of Star Trek: The Next Generation), but not quite as villains, either. Often times with spin-off material like this (I'm looking at you, Star Wars novels and comics), characters feel pretty distant from the versions we've come to know from the screen. While there are definitely some pure comic-bookish elements to this story, including a little T & A that was rampant in comics at the time, everything feels like the Trek of the movies, only with the added benefit of deep-rooted connections to the TV show that started it all. I really like Peter David's writing on the comics. 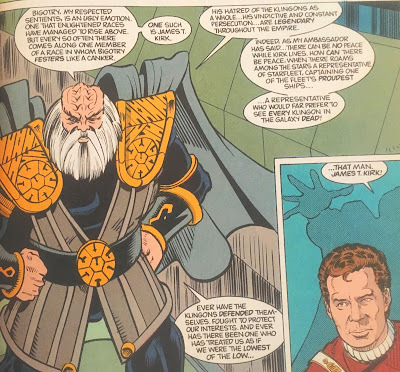 Aside from his other comic book work, which includes defining runs on The Incredible Hulk and Aquaman, he's had a long history with Trek over the years. David is responsible for some of the most highly-regarded Star Trek novels (like Imzadi), and even co-created the multi-book series Star Trek: New Frontier with John J. Ordover. I think David has a real ear for the characters and is clearly a fan of the source material. Spock sounds like Spock, Bones like Bones, and most importantly, Kirk like Kirk. He even gives Kirk multiple pauses during his dialogue, replicating the famous Shatner delivery. Even characters like Sulu and Uhura just feel "right." It's kind of a shame that Peter David didn't have a great relationship with Gene Rodenberry's people (particularly Richard Arnold, who is blamed with making the comics a lot less fun) and left the title just a few of issues after the conclusion of this story. It's a pity; David writes with a real sense of quirk, making sure that this stuff never takes itself too seriously, which is in keeping with the spirit of the original show and the movies. Of all the tie-in writers associated with this franchise over the years, Peter David may be one of the best. It's too bad that he didn't contribute more to this comic's 80-issue run. 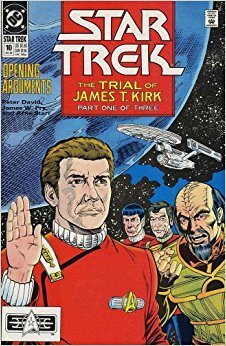 These books from DC are a really great addition to the world of Star Trek, and "The Trial of James T. Kirk" is a fun read that successfully connects the movie timeline to the timeline of the original television series. 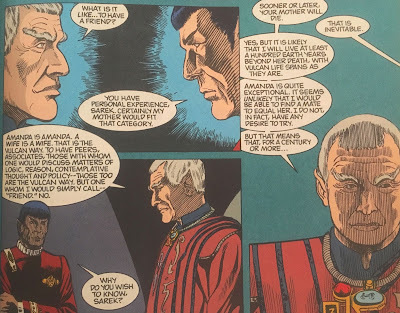 It's lamentable that Peter David didn't write more Star Trek comics; his take on the characters rings true and he would have gone in some interesting directions had he been allowed creative freedom. But at least we have these issues, offering a fun little glimpse into Kirk's past, as well as a reminder that the mighty James T. Kirk is just as flawed and human as the rest of us.